The knee injury osteoarthritis score (KOOS) is an adult outcome measure used for assessing the patients' perspectives of their knee pain and disability. This tool was developed initially to use on adults. 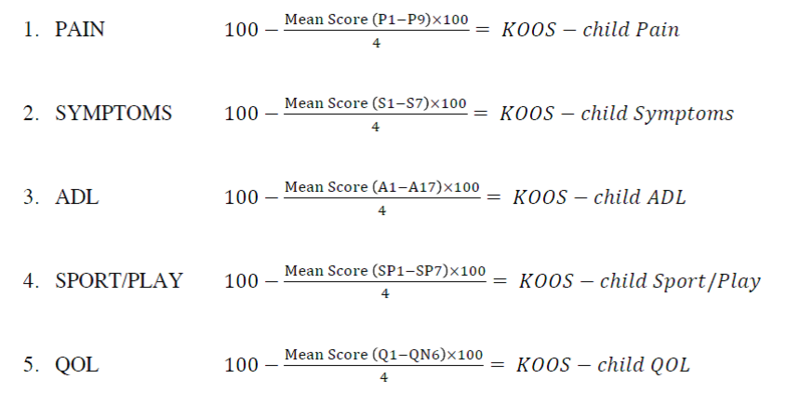 The KOOS pschometric properties have shown high reliability and validity, and is responsive to change in subjects with knee degeneration or knee injury. It was highlighted form this study that children who had undergone knee surgery or physiotherapy had a greater understanding of the medical terminology than those who had not. As such. they had a better comprehension of the KOOS for adults. It was recommended that due to this lack of comprehension in those who were not familiar with the terminology or younger children that the KOOS would need to be modified for them. This study did not identify a cut-off age for which the KOOS adult should be used, but recommended that comprehension was limited in younger children. Construct validity - All of the hypothesis were confirmed therefore this indicated that there was excellent construct validity. Test-retest reliability - found that all test-retest's were excellent for all sub-scale except the symptoms scale which was slightly lower reliability. Responsiveness - a hypothesis of a correlation of ≥ 0.3 between the KOOS Child sub-scale scores and the Global Perceived Effect (GPE) was confirmed therefore confirming the responsiveness of the KOOS Child. Overall, the KOOS-Child shows excellent psychometric properties in all areas except internal consistency where the category 'symptoms' showed lower homogeneity, similar to the KOOS - Adult, and was thought to be due to patients being able to experience a wide variety of symptoms with knee conditions. Unlike the KOOS - Adult where certain conditions are recommended for its use, the KOOS - Child can be used in a broad population of children with different knee disorders. This page on paediatric knee disorders explorers different pathologies in which it may be used. During the past month, how often have you experienced knee pain? Each subcategory is then added together. For example, all questions relating to pain are numbered P1, P2, P3, all questions relating to symptoms are numbered S1, S2, S3, etc. Alternatively there is an excel spreadsheet which is downloadable from this website. The files name is the updated scoring file. ↑ Roos E M, Roos H P, Ekdahl C, Lohmander L S. Knee injury and Osteoarthritis Outcome Score (KOOS)—validation of a Swedish version. Scandinavian Journal of Medical Science and Sports 1998; 8:439-48. ↑ Willis G B, Royston P, Bercini D. The use of verbal report methods in the development and testing of survey questionnaires. Applied cognitive Psychology 1991; 5: 251-67.